Lincoln College of Technology enlisted the help of Mid America Motorworks and PERFORMANCE CHOICE to completely restore a C4 Corvette as their 2012 class project. Senior Regional DirectorÂ of High School Admissions Bill Zimmerman’s class bought the burgundy C4 in January of 2012, with plans to restore it. Zimmerman wanted his students to learn a variety of processes and techniquest for restoring and refinishing cars. 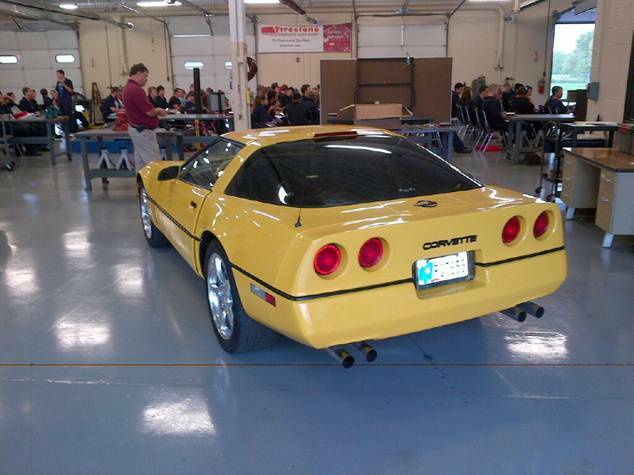 Students at Lincoln College completely disassembled the C4 Corvette and sanded it down. They then painted the C4 a yellow pearl finish, and added new seats, among other interior parts, all from Mid America Motorworks. The interior came from PERFORMANCE CHOICE and each student worked on the Corvette, all signing the inside of the hood. According to Zimmerman, some of the finest automotive technicians are produced at Lincoln College. They are highly sought after in the automotive industry.Â “Passing on the passion of the automotive industry to youth,” says Zimmerman, “is very important.” The C4 Corvette has visited several high school vocational programs to share the value of the automotive indsutry with young students. 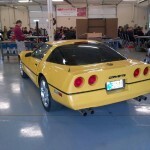 Zimmerman and his class will bring the C4 Corvette to the Corvette Funfest in 2013 in Effingham, IL, on September 19-22. The students will share their story and the contributions they made on the project. Toyota has chosen to recall 2.5-million vehicles in the U.S. following a probe by NHTSA into a problem with a faulty power window. Nearly 7.5-million vehicles may be affected globally. The driver’s side power window on affected vehicles may experience a sticky feel during operation. Depending on what grease has been applied to the switch to reduce the stickiness and how it was applied may affect the switch which could melt, smoke or start a fire. The faulty power switch isÂ linked to several hundred reports of fires and smoke and at least nine injuries. The effected vehicles include: 2008 Highlander Hybrid, 2009 Corolla and Matrix, 2007-08 Yaris, 2007-09 Camry, 2007-09 RAV4, 2007-09 Camry Hybrid, 2007-09 Tundra, 2008-09 Scion xD, 2008-09 Scion xA, 2008-09 Sequoia, 2008 Highlander. Letters will be sent to owners in October and repairs will take approximately 1 hour to make. 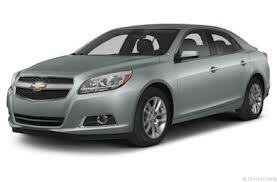 The previous Malibu sedan was well-received by consumers for its all-over restyle and departure from past versions. The 2013 Malibu will fare even better, weâ€™re predicting, due not only to its new styling but to its refinement. Â This is a beautiful vehicle that rides well, is comfortable, quiet and luxurious. Â This writer was impressed with the changes in the 2013 Malibu; a lot more â€˜upscaleâ€™ than the 2012 model. As expected, the new 2013 Malibu comes equipped with plenty of goodies. It is available in a LS ($22,390)version, three levels of LT-1 $24,005),2 ($25,240), andÂ 3 ($26,950) and the LTZ 1-($27,830) and LTZ 2-($30,165). There areÂ two hybrid versions: ECO 1SA ($25,335) and ECO 2SA ($26,945). Our test vehicle was the 2LT Eco version and had mid-range pricing just over $25,000. The Atlantis Blue Metallic is a knock-out of a color in the Malibu. Competitive with the ever-popular Honda Accord and Toyota Camry, Malibu also joins this crowded, yet sought-after mid-size category. Our ECO version, as a hybrid, brings a higher price, but the combined 29 mpg. Overall provides the best mpg. of the non-hybrid or non-diesel family sedans.Â The battery fits nicely in the Malibu trunk, leaving plenty of room for luggage. The 2013 Malibu sedan comes equipped with driver/passenger frontal and knee bolster and head curtain and side airbags. Stabilitrank stability control is standard as are traction control and ABS. Six months of OnStar directions and connections is standard, as are Daytime Running Lamps, tire pressure monitoring system, power windows/mirrors/locks and eight-way driverâ€™s seat with power recline and lumbar. The passenger gets a 4-way manual, 2-way power vertical seat, the steering wheel is leather-wrapped and has tilt and telescopic capability. Our 2LT ECO Malibu came with a few options, including Electronics and Entertainment Package ($1,175: audio system, Pioneer premium 9-speaker, 250 watt amplifier, rear vision camera system, body-color bodyside moldings, 120-volt power outlet, universal home remote, auto-dimming inside rearview mirror and convenience trunk net); Convenience Net Package ($395: advanced safety package, forward collision alert, lane departure warning); Cocoa fashion trim ($150). There are so many better entries in the midsize sedan market for 2013. Consumers should try them all before settling for an Accord or mundane Toyota Camry. The Malibu, like others (namely, Hyundai Sonata, Kia Optima) have so much more personality and individuality to offer. We recommend you give the new 2013 Malibu a test drive. We think youâ€™ll be won over. New to the Dodge lineup, Dart fits nicely into the compact sedan segment and competes with Chevrolet Cruze, Ford Focus, Hyundai Elantra, Toyota Corolla, Honda Civic and VW Jetta. A formidable group of performers, although the Dodge Dart should be able to hold its own. Based on the Alfa Romeo Giulietta and designed by Dodge, the new Dart is the first of the Chrylser/Fiat partnership products to utilize the CUS-wide architecture. Future products from the combined marriage of Chrysler and Fiat will utilize this same platform. Consumers can opt for one of three different four-cylinder engines in the new Dart: 1.5-liter, 160 hp., 2.0-liter, 160 hp., and 2.4-liter, 184 horse, all Turbo. Our test vehicle came equipped with the 2.0-liter, six-speed manualÂ transmissionÂ which seemed to offer plenty of around-town power. Consumers can also opt for different transmissions: 6-speed sequential, 6-speed manual and 6-speed automatic. 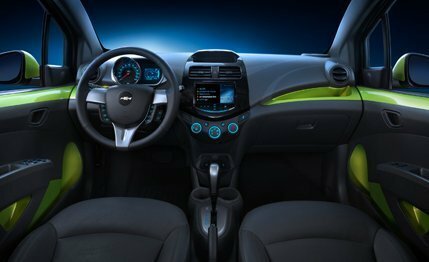 The interior of the new Dart is surprisingly refined, not what you would expect in a compact sedan. The seats are comfortable and supportive and the IP display is large and bright. It would be impossible to miss your speed, staring right at you. Although the interior feels roomy, there isnâ€™t a lot of legroom. Â The Dart is an agile, quick vehicle with a composed ride. As with some of theÂ Â competition in this segment, the Dart is a fun car to drive, maneuvers well and delivers as a daily driver with some style. 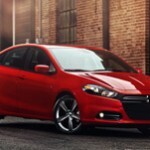 Dodge expects the Dart to appeal to a diverse customer base, ranging from millennials to empty nesters. What consumers will love are the 100,000 ways the Dart can be customized to meet their specific needs. Â Dart is available in six models, 12 exterior colors and 14 interior color and trim choices. In addition, there are four different grilles on the Dart, seven wheels and of course, the three available powertrains. The Dart is available in four trim levels: SE, SXT, Dart Rallaye and Dart Limited. Solar control glass is a nice feature, particularly if one lives in warmer climates. As with many vehicles today, the new Dart comes equipped with several airbags, including front and rear supplemental side airbags, driver inflated knee bolster airbags, Advanced Multistage front airbags and three rear seat restraints. 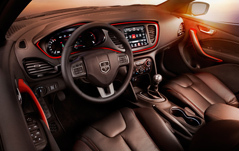 The Dart has won several awards in its infancy, including KBB.comâ€™s 2012 list of the 10 Coolest Cars, and Wardâ€™sÂ 10 Best Interiors. Unlike the competition, Dart offers standard and optional equipment features that are not often found on a compact sedan, such as rear crosspath detection, heated steering wheel, full-color 7-inch thin film transistor customizable LED instrument cluster, 8.4-inch touchscreen radio/media center, ABS and projector headlamps, among other features. 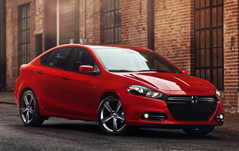 If youâ€™re in the market for a compact sedan, donâ€™t pass up the Dodge Dart. We think youâ€™ll be pleasantly surprised. EPA Fuel Economy: 25/36/29-27/39/32 mpg. At first glance, folks will of course, think of the SMART Fortwo car, but the new Chevrolet Spark is much more, including a little more of a car. Driving Chevyâ€™s new offering, built in Bupyeong, South Korea is so much fun, and practical besides. Competition for the Spark includes Mazda 2, Scion iQ, Fiat 500 and the Toyota Yaris 5-door, hatchback. We had the opportunity to spend some time in the all-new to the lineup Spark, driving the 2.LT automatic version. The Spark is a five-door configuration with the design of a three-door, including hidden rear door handles. Our test vehicle was a bright, hard to miss Jalapeno green, one of many â€œvibrantâ€ color choices with names like Salsa, Denim, Lemonade and Techno Pink. Too fun. With a starting price of $15,970, the 2LT is one ofÂ versions. Opting for the 2LT trim level gives drivers a few more standard features one canâ€™t help but get used to, such as power windows, trim leatherette seats, power doors, locks, Premium sound, A/C, floor mats front/back, leather-wrapped steering wheel, XM radio, etc. The Chevrolet Spark is equipped with 10 airbags, standard on all models, a seven-inch color touch-screen with MyLink radio, USB port (1LT, 2LT), Pandora Internet radio and Stitcher Smart Radio apps, with Bluetooth, Fifteen-inch aluminum wheels, flip/fold rear seat with 60/40 split, StabiliTrak electronic stability control, four-wheel ABS with Brake Assist, Hill Start Assist and OnStar with six months of Directions and Connections plan. A lot in a small package. The Spark rides well, it is a smooth, quiet car for its size, although a tad hard on some of the rougher road surfaces. The interior is roomy and seating comfortable. One sits high for good visibility.Â Engine idle is quiet and driving is effortless. With only 84 horse, Spark seems to get up to speed in a decent amount of time. We especially loved the iridescent lighting on the IP and dash. So high tech! The IP sits directly in front of the driver so no excuse for not knowing how fast youâ€™re traveling. Testing the Spark on a rainy, dreary day allowed for what it feels like to be on a wet surface. The Spark held the road well for a vehicle its size, no slips or misses. A rear windshield wiper helps out during downpours. Although one may not be able to carry large loads in the Spark, 31.2 cu. Ft. of space does allow for plenty of â€˜stuff,â€™ or maybe a dog crate. Fuel economy, as would be expected in a vehicle in this class is 32/38, with a 9.2 gallon fuel tank. Good news in todayâ€™s world of ever-rising gas prices. A hatchback, Spark is in competition with the Honda Fit. Overseas the Spark is sold with a choice of a 1.0- or 1.2-liter, 4-cylinder engine. Choices of transmission are a 5-speed manual and 4-speed automatic. Our test vehicle came equipped with automatic, although we would have liked to drive the manual, with the expectation that it would be a fun drive. The Spark has a variety of storage compartments that would no doubt come in handy. Trim lines in the new Spark are LS, 1LT and 2LT. Look for a smartphone app to deliver fully-functioning navigation including live traffic updates. EPA fuel Economy: 28-32/37-38 mpg.